Trinity Kitchen’s newest set of street food traders have rolled into Leeds, and I’d been wondering for a while what newbies they could bring in to keep us punters coming back for more. With the usual buzz on Twitter with who’d be in the new line-up I had a nosey after school on Tuesday to find out. 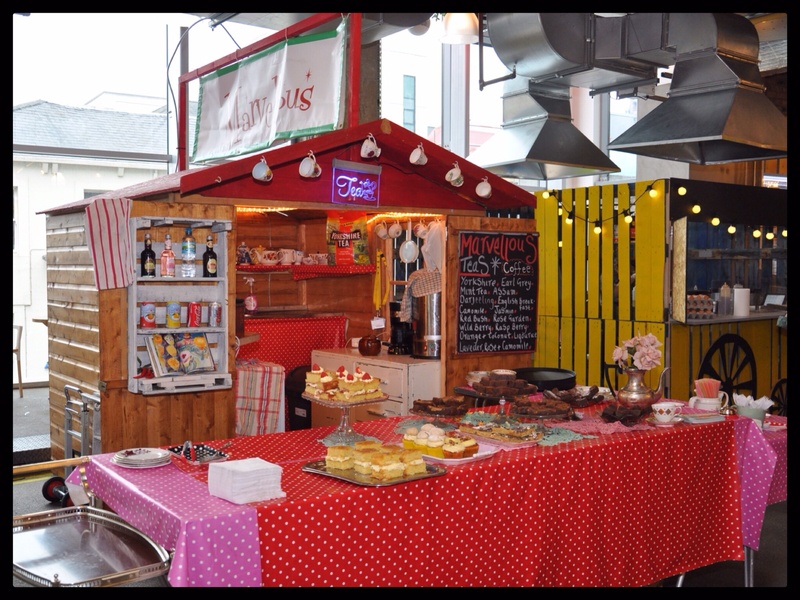 The first stall to catch my eye and tastebuds was London based Mei Mei’s Street Cart. Mei Mei’s been making Jian Bing (filled Chinese Crepes) since childhood and obviously has cooking Chinese food in the DNA, with a grandmother that is a huge cooking inspiration. I’d known what a Jian Bing was, but had never eaten one so this was a new Chinese food staple for me, and one that I was itching to get my hands on. Being a roast pork fiend there was only EVER going to be one choice for my first Jian Bing – Char Sui Pork! I watched intently as Mei Mei made my Jian Bing. 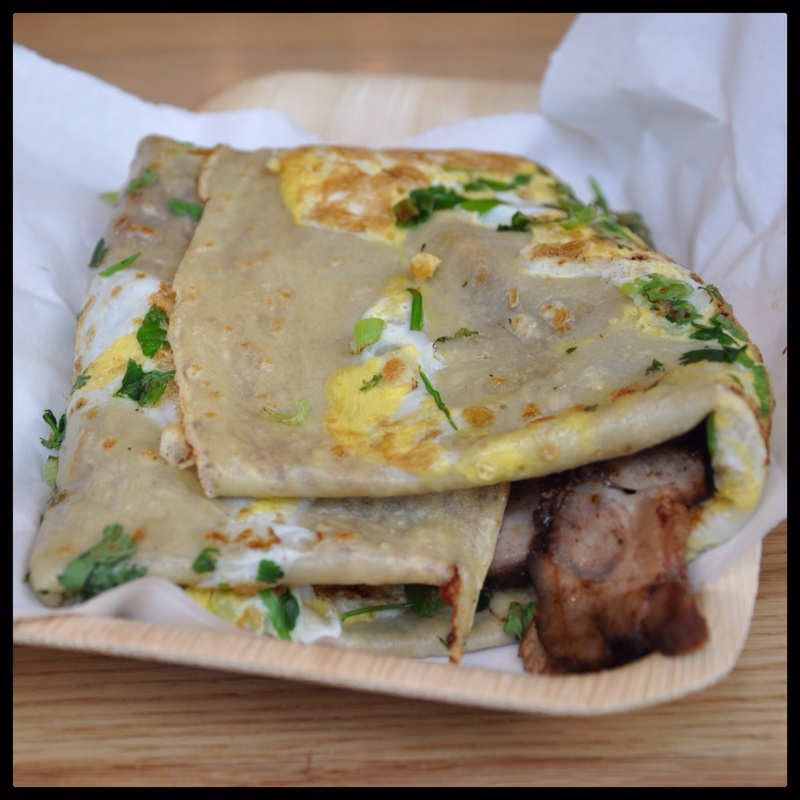 I loved the idea of having the spring onion and coriander embedded on one side as she flipped the crepe over whilst cooking it, with a thin covering of soy, hoisin and chilli sauce painted on the other. A layer of Char Sui pork and finally the addition of crispy wonton which was a GENIUS idea. Here’s the final product, a thin crepe filled with Char Sui pork that had been marinated for 24 hours. It had flavourful, juicy meat and was lip-smackingly good. The chilli/soy/hoisin sauce combo gave a sweet, salty, mild heat that worked well with the pork. I really liked the additional greenery too, especially the coriander which added freshness. All of this folded up into a parcel that was nearly the size of my FACE, it was that large! 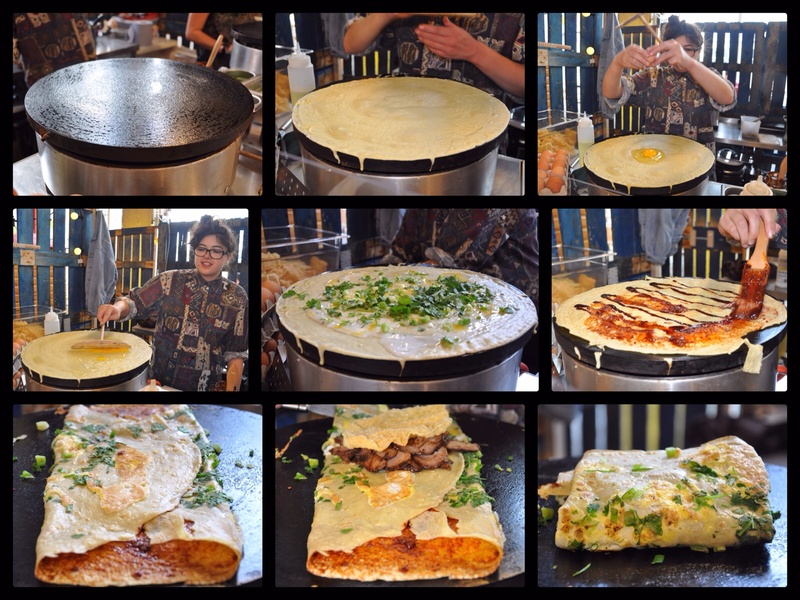 This isn’t just any simple crepe, it’s a street food crepe elevated up a notch with a tonne of flavours and textures all in one shebang! I sat there a VERY happy girl and enjoyed every mouthful! 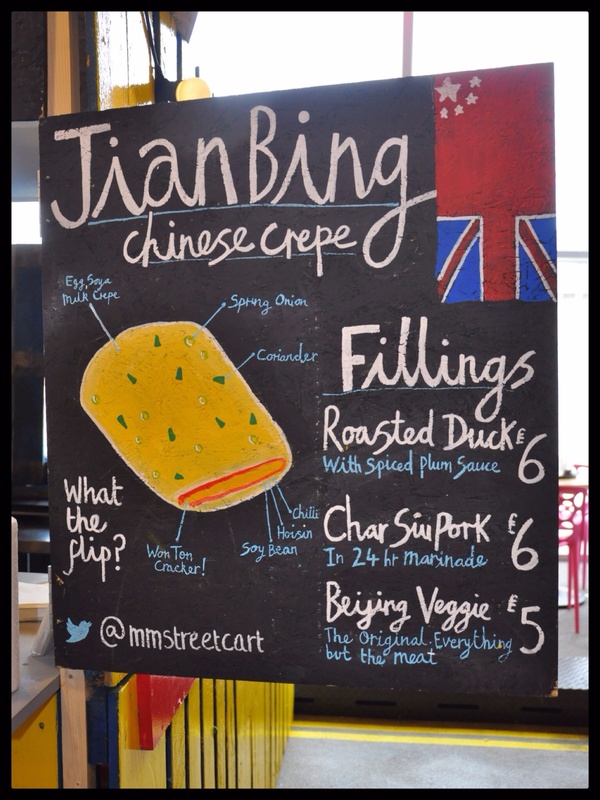 I’m definitely going to have to make these Jian Bing at home!!! My next stop was The Cheese Truck, who are based in London and are friends with Donastia Social Club and Original Fry Up Material. 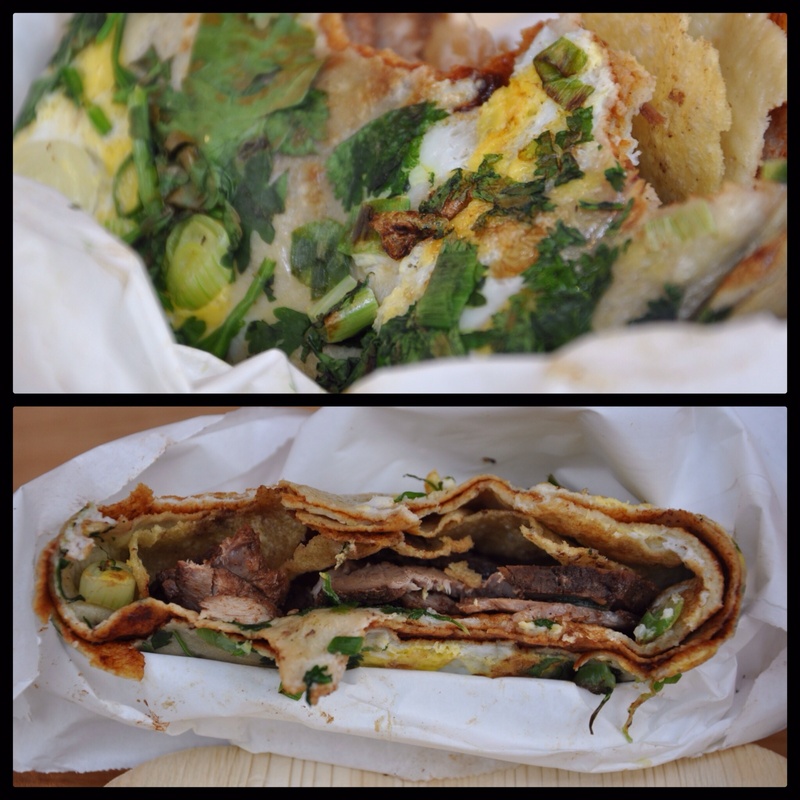 Arguably two of the most popular traders to date at Trinity Kitchen, and definitely in my list of faves so far! 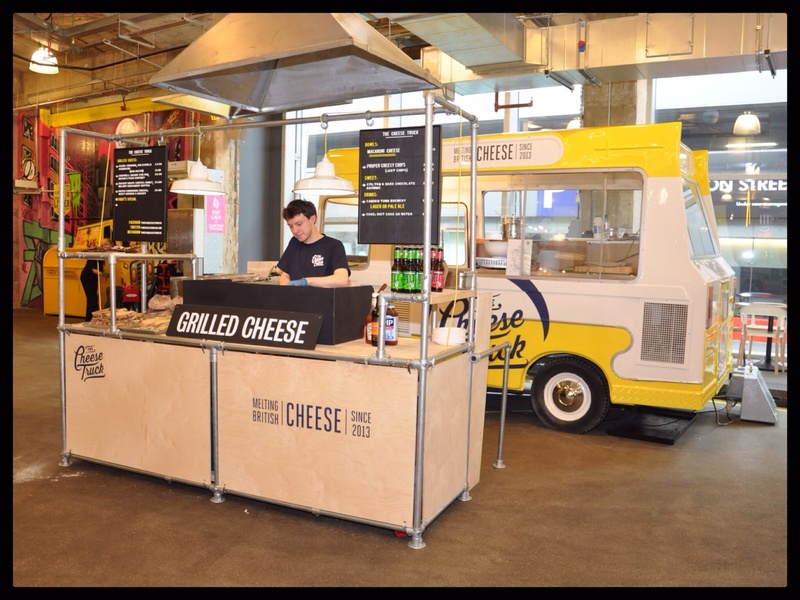 Mathew set up The Cheese Truck after being inspired from a trip to the USA, and having already worked in the hospitality industry, whether it was for a catering company, setting up a restaurant in Covent Garden or working on the PR side of the business, he saw this as a natural progression. 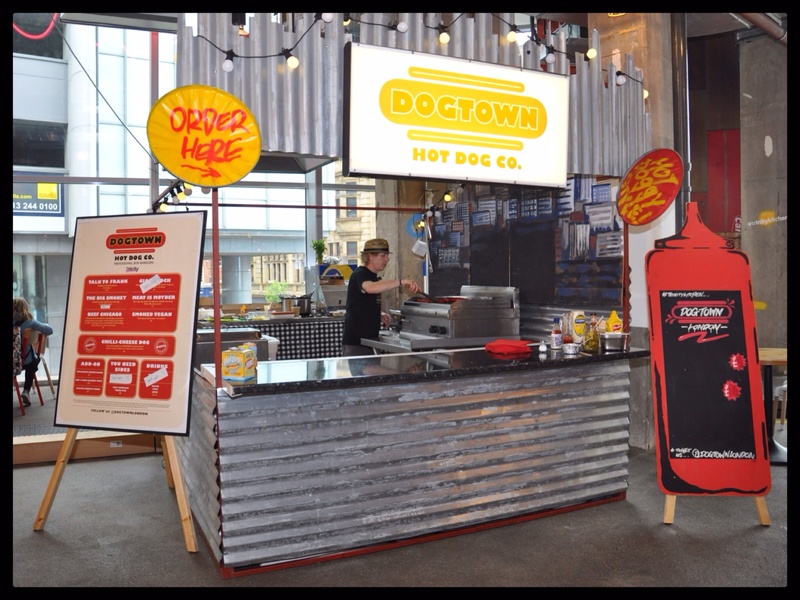 With their cool industrial feel cooking station they sell their grilled cheese sandwiches with a range of fillings. I tried their Grilled Cheese with Keens Cheddar, Ogleshield and onion mix. 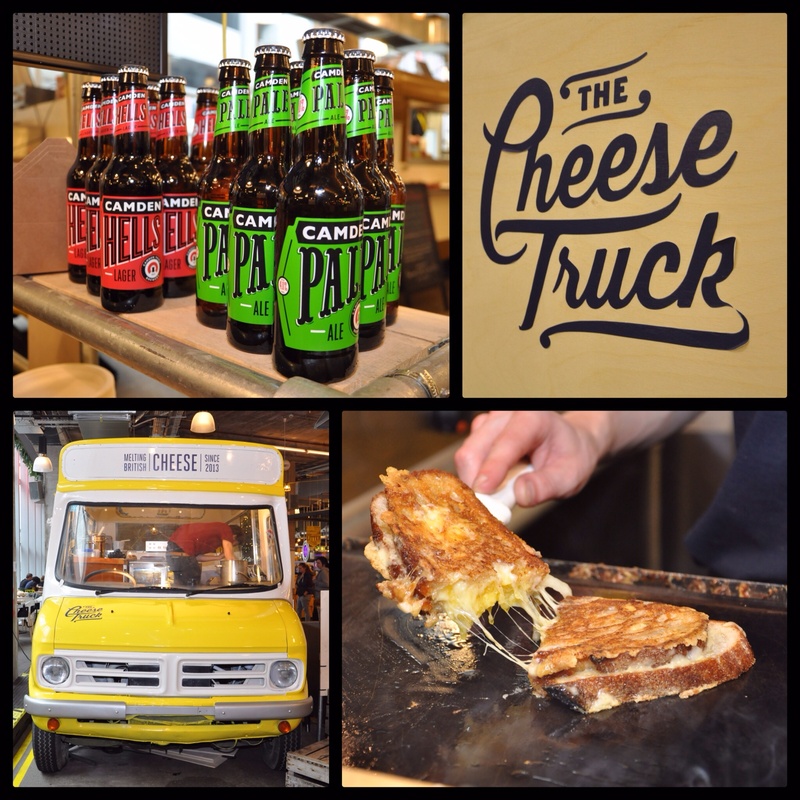 The Cheese Truck’s beers from Camden Town and their cute ice-cream van/cheese truck! My sandwich was filled with perfectly gooey cheese that did the whole stretchy thing when you take a bite. It was incredibly cheesy, but with the addition of the onion it doesn’t get too overpowering and helps to cut through the richness. All inside two slices of Sourdough from Leeds’ very own artisan bakers Leeds Bread Coop. Definitely fantastic comfort food! The other one that really took my fancy was the Grilled Cheese with Queso Chihuahua cheese, spicy chorizo and rocket. 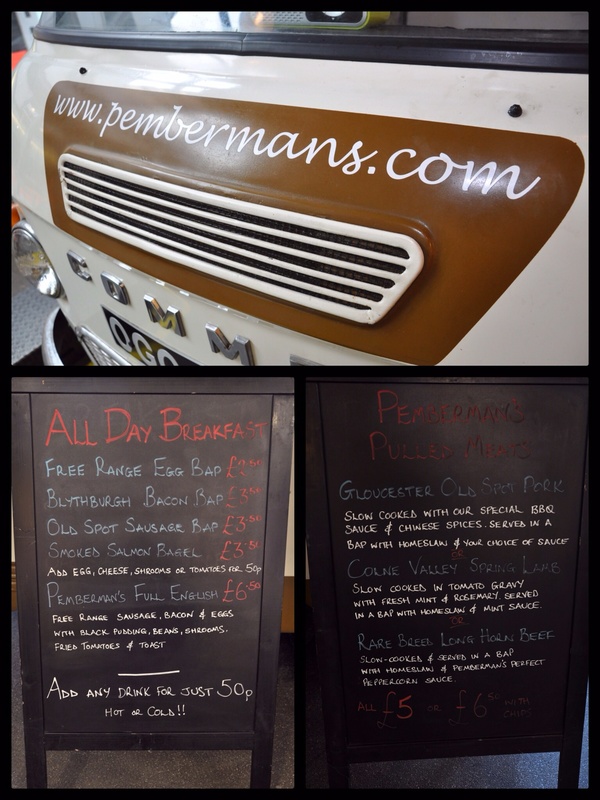 The final new trader to grace this month’s Trinity Kitchen is Pembermen’s from London. 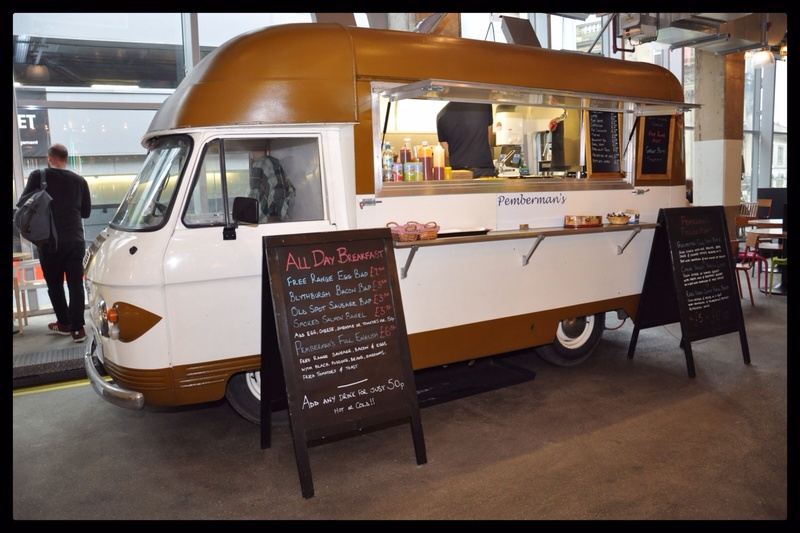 Serving baps filled with breakfast items or pulled meats (using local sources) from the hatch in their converted 1972 Commer camper van. I REALLY REALLY wanted to try something out, but I was too full to contemplate a third course. I think the All Day breakfast and pulled meat baps have my name written ALL over them though, especially the Gloucester Old Spot pulled pork! They also have coffee on the go and homemade biscuits too! 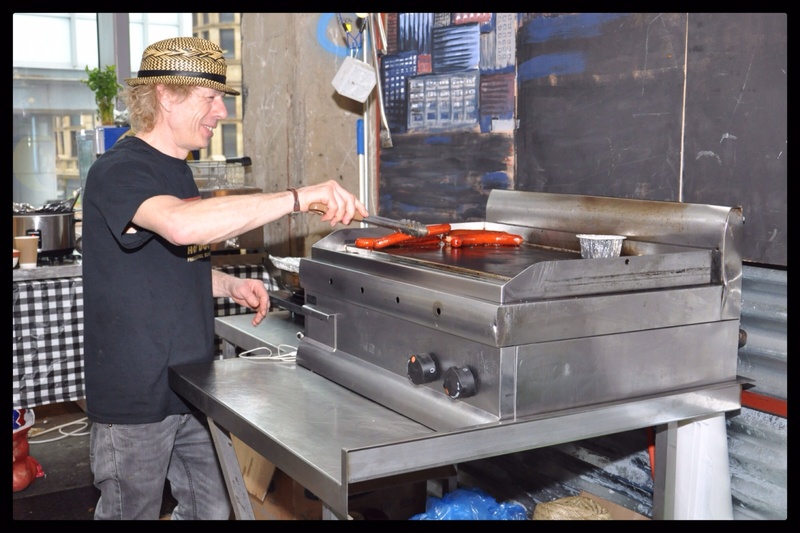 Repeat offenders to Trinity Kitchen are Dogtown Hot Dog Co. and The Marvellous Tea Company, back with their hotdogs and cakes!! I was getting a little worried that Trinity Kitchen would run out of ideas, but from what I tried I feel positive about these. I’ll be back soon to try a bit more, especially to get my first Pembermen’s! 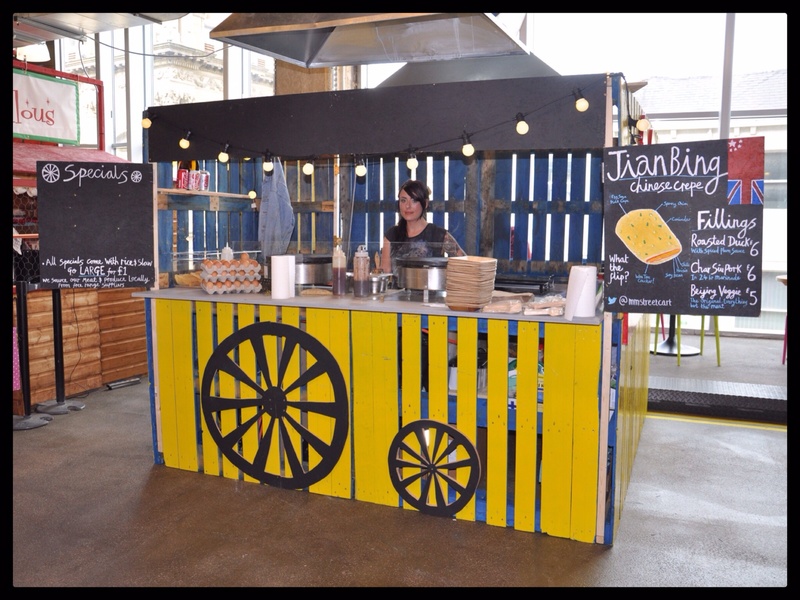 What street food would you love to see being served at Trinity Kitchen, and are there any street food traders you would love to see back again? For those of you who are regular readers of the blog, you’d know that I’ve been searching for the best Afternoon Tea in Leeds. So far, there have been highs and lows, mostly highs which is a good thing, but I’m still on the hunt! 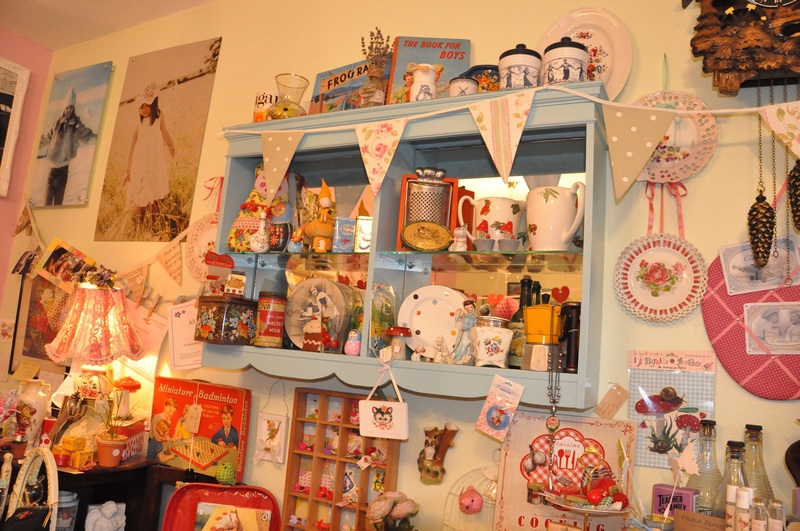 So after a short hiatus I’m back on the case and continuing my search with a tea room called Dulcie Butterfly. 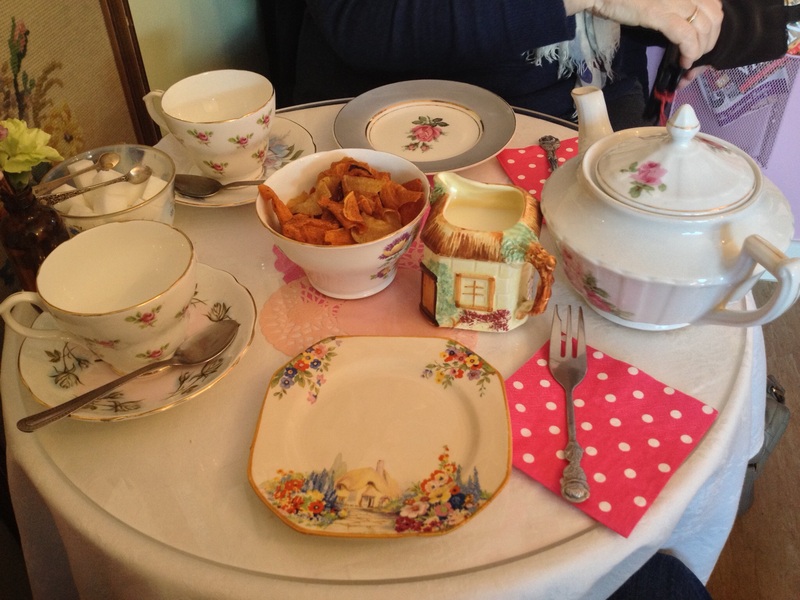 During the February half term school holidays, in between marking a boot full of books and catching up with old friends, I visited Dulcie Butterfly, a small tea room in Swillington. For those of you who aren’t familiar with the area, Swillington is a small leafy village on the edge of Leeds. With my regular dining partners having other commitments, good old Twitter came to the rescue and found me a partner in crime for the afternoon. This came in the welcome form of Lynn Hill, the lady who set up and runs the renowned Clandestine Cake Club, definitely a person who knows her stuff when it comes to baked goods! After a few correspondences we met at Dulcie Butterfly in a small residential area, not where I expected to find at all. From the outside it’s quite deceptive and only gives you a hint of the interior to this tea room. 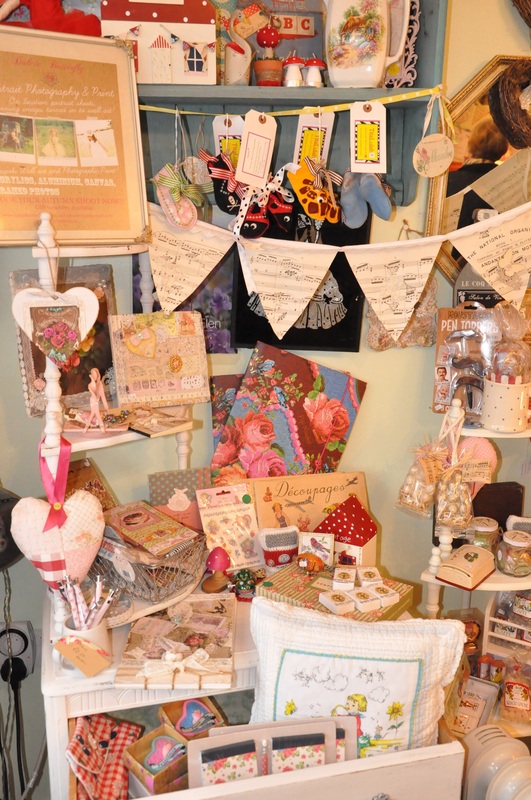 Once inside you are surrounded by lots of ornaments, keepsakes and interior decorations. 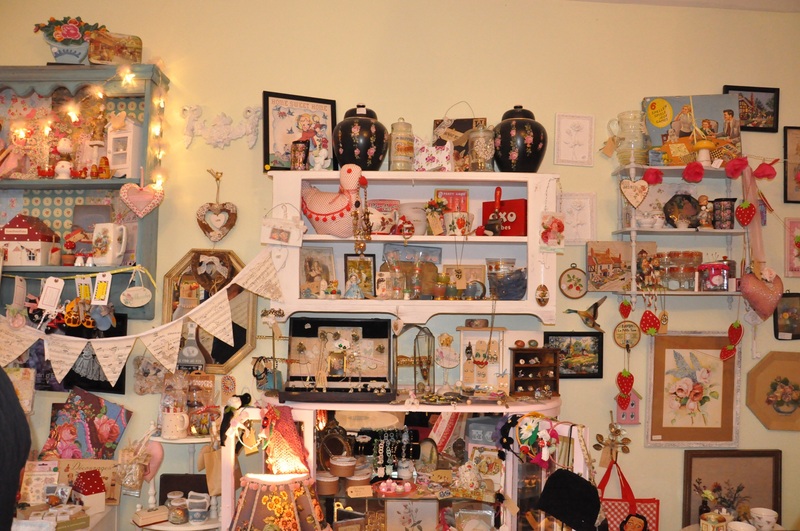 It’s a complete treasure trove of trinkets, with many of them being purchased on Dulcie’s trips in Europe. I immediately found Dulcie very charming and full of life, with the interior maybe being a reflection of her personality. After being seated at our table which had lovely crockery all laid out, Dulcie offered us a pot of tea, what a good start. You can’t have afternoon tea without a good pot of tea, we were pleased to see it was Yorkshire Tea as well!! 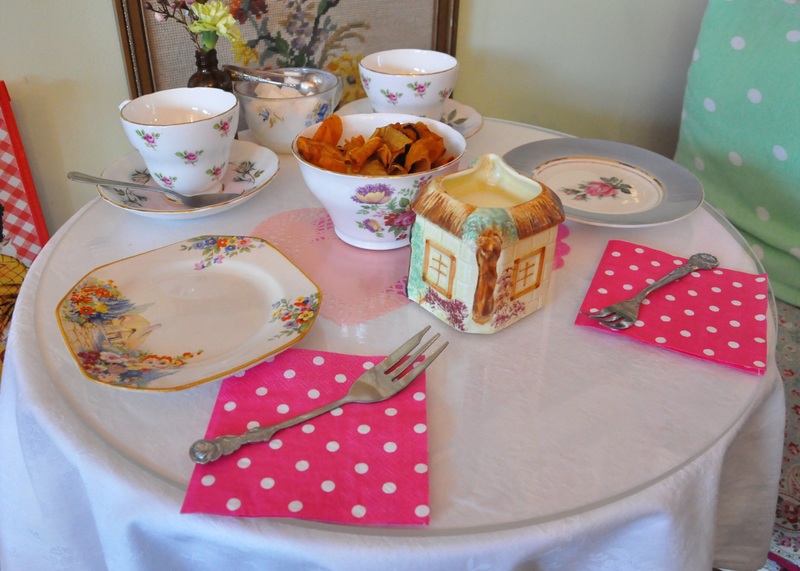 We quickly settled into our surroundings, with our Yorkshire tea setting us up nicely for the pretty 2 tier cake stand Dulcie brought holding sandwiches, cakes and scones! First we tucked into the sandwiches – cheese and onion and ham and cheese, made with very soft bread and were generously filled. The tea was going down well and Dulcie happily gave us a fresh pot of tea when we were running out, a lovely touch. Next we worked our way onto the fruit scones which were filled with jam and cream. 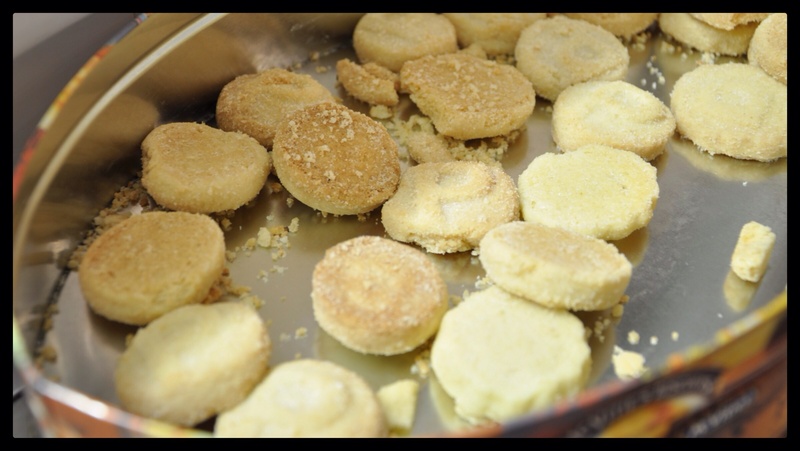 Crumbly without falling completely to bits in your hand, very delicious and well made. 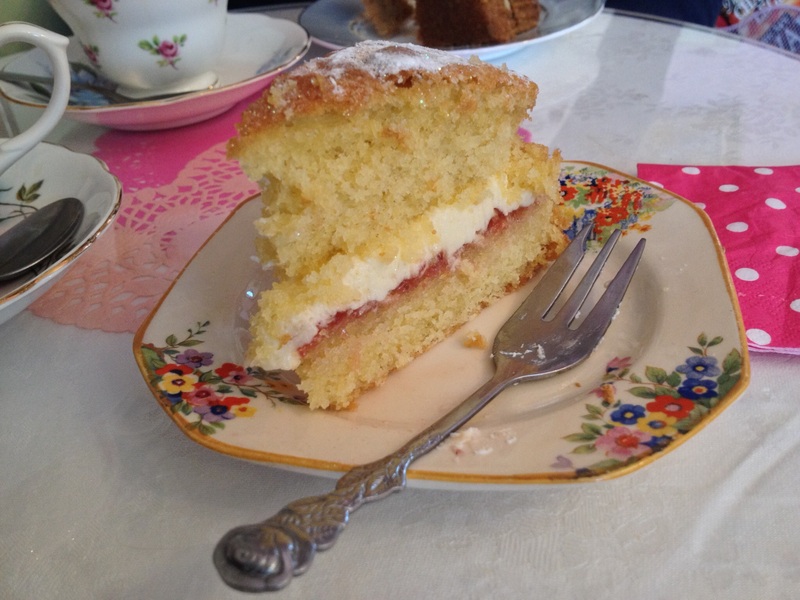 Lastly we had cake to finish off our lovely afternoon, a coffee cake and my absolute favourite; classic Victoria Sponge. Again regular readers may know how fond I am of this cake, so much so it was the top tier on our wedding cake! When done well, there’s much not to beat it and this was done really well. Compliments to the baker, who happens to be a food technology teacher friend from the local school. I personally enjoyed our afternoon very much indeed, the place maybe petite, but Dulcie’s personality makes up for this and is infectious, she obviously enjoys what she does and it shows. Each part of our tea was well made and tasted great. 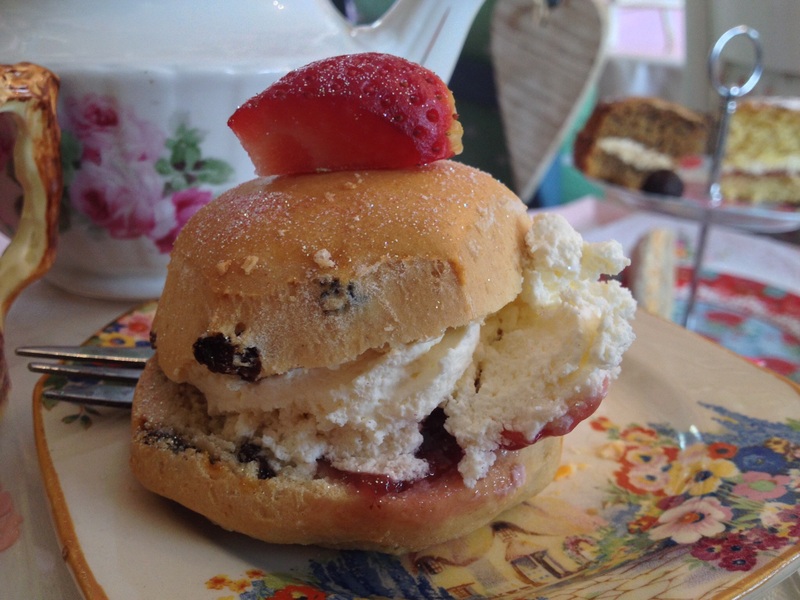 With plenty of Yorkshire tea to wash it down with, it’s certainly a lovely way to spend the afternoon with friends! It may not be in the middle of Leeds, but it’s definitely worth a little jaunt out, I would be more than happy bringing my friends here! 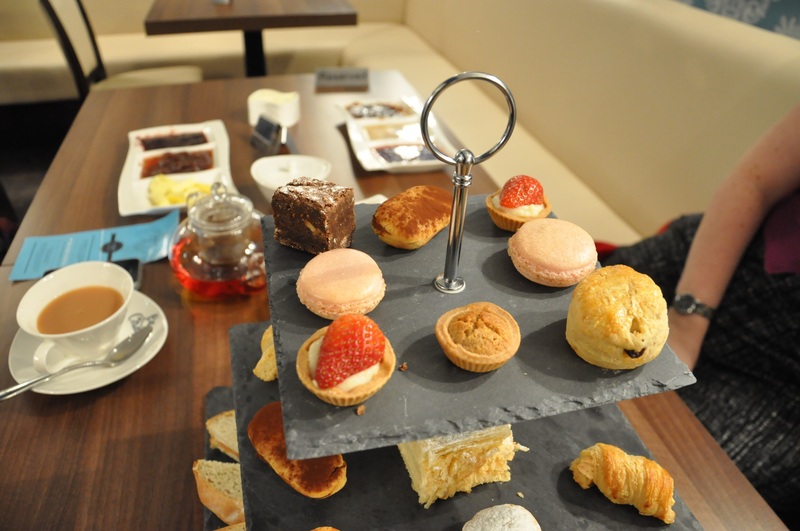 Afternoon tea is £11 – £15 depending on date and time (after 2pm on Saturdays – £15) per person. Disclaimer: I was invited by Dulcie to review the venue so my afternoon tea was complimentary, this was done of course, in exchange for my honest and unbiased opinion. After a long, hard day of educating today’s youth (le sigh! 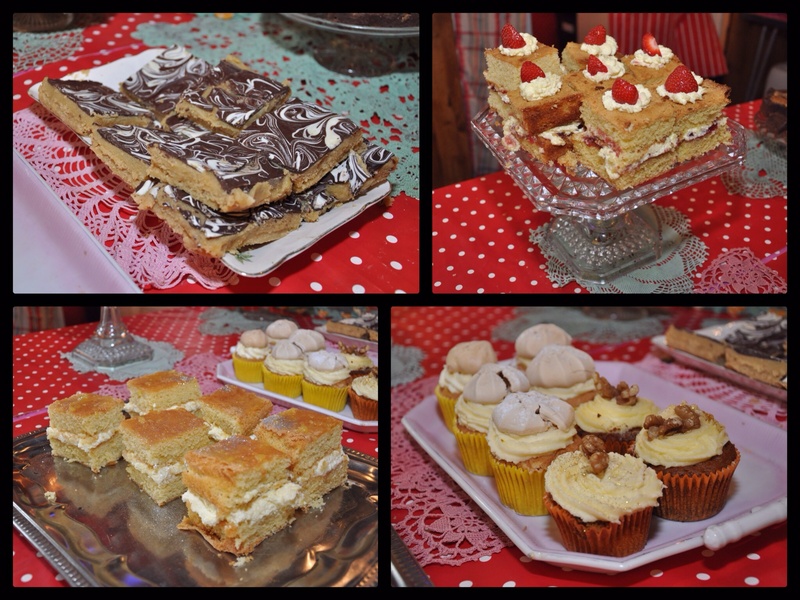 ), what’s better than going into the big smoke and cramming your face full of cream cakes? The answer: nothing, that’s what! So with impending indulgence in mind and a hungry Miss Taleoftwosittings, we toddled along to Le Chalet, a new French themed tearoom on Park Row in Leeds. From the classy and modern interior, to the friendly warm welcome we received when we walked in, things just kept getting better and better. Apart from cream-themed gluttony, we were there for a real purpose: our search for Leeds best afternoon tea. Just from a quick glance at a few older posts on this blog you will see that we have had our fair share of disappointing afternoon teas. Le Chalet seemed to be a shimmering oasis in a desert of dry and flaky scones – but did it live up to expectations? We ordered two classic afternoon teas and whilst my friend asked for an English breakfast tea, I decided to opt for the exotic sounding Butterfly Dance (blooming) tea. Upon being presented with two attractive glass teapots, I was able to see why my tea earns its name. A large ball of green tea lay at the bottom of my pot, but slowly unfurled to reveal beautiful Jasmine, Lily and Marigold flowers. It had a delicate but floral taste and was extremely refreshing, especially after a long day of cheap coffee scraped from the bottom of the staff room coffee jar. 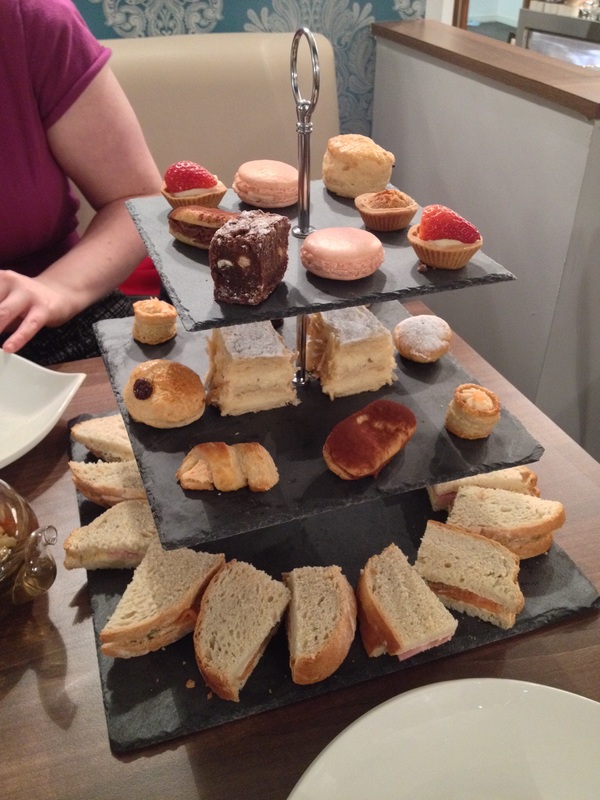 After a short time, our afternoon tea stand arrived, and we were not disappointed. On the three tiered, contemporary slate stand we had our chosen sandwiches, smoked salmon with dill and lemon and cured ham and mustard on the bottom layer. There were more sandwiches on offer, but being given the choice of exactly what you’d like is a rare but pleasing idea. 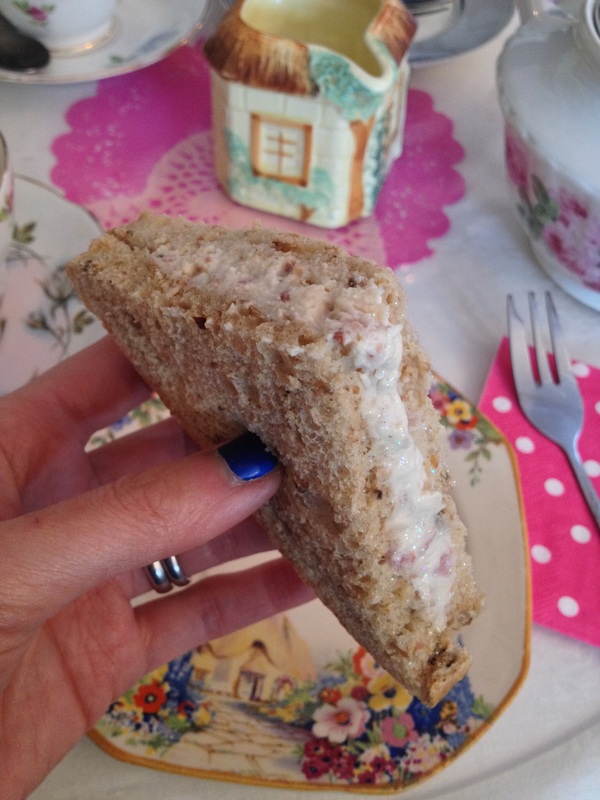 Too often with afternoon teas you end up with a few sandwiches that no one wants (in my experience it’s the mayonnaise smeared ones: the work of the Devil). 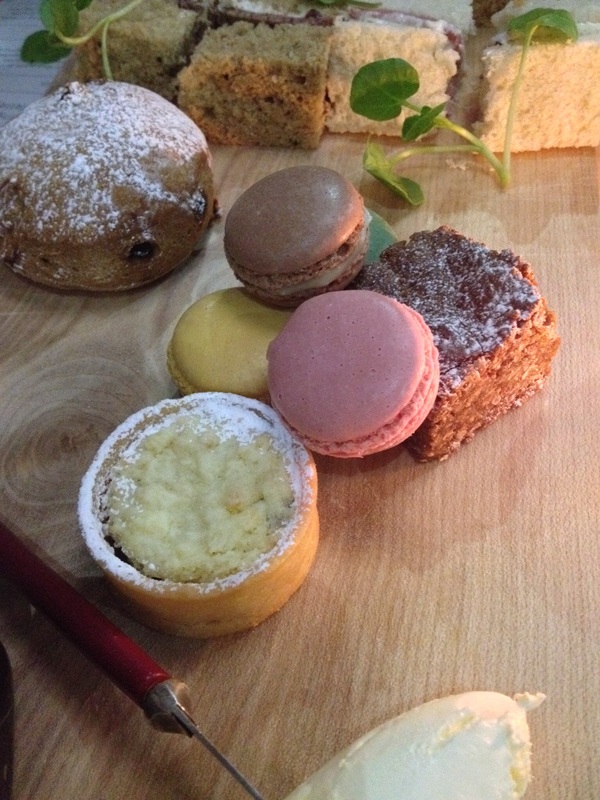 Being able to design your own afternoon tea is a great idea and one that will hopefully be very popular. Our sandwiches were delicious – the bread was soft and freshly baked and the filling was generous and obviously top quality ingredients. After that sumptuously savoury starter, our eyes moved up to the next layer, which held yet more bite-sized delights in the form of salmon mousse canapés, small chocolate cream éclairs, walnut chocolate brownies, vanilla cream slices and dreamy little creamy choux balls that, I was reliably informed, are called chouquettes. Ooh la la! Each treat was delightful in its own way. Every bite-sized morsel stood up on its own in terms of taste and quality and the variety of textures, like the crisp mille-feuille top of the cream slices and the rich, fudgy brownie, made it a real sensual overload. And we’d not even ventured on to the top layer. Oh Oui! The top layer held delicate pink macarons, a miniature almond tart, tiny strawberry tarts and two scones, warm and freshly baked. Not yet full to the brim with cake-shaped joy, we marvelled at the generous jam tray that accompanied the cakes; they had the classic strawberry jam and honey alongside the interesting and toothsome combinations of rose and raspberry, ginger and rhubarb and gooseberry and elderflower. All were equally delectable and really brought the tea to a wonderful end. In the search for a brilliant and affordable afternoon tea, as well as friendly, warm service, you need look no further: Le Chalet is waiting for you. Vive la France! 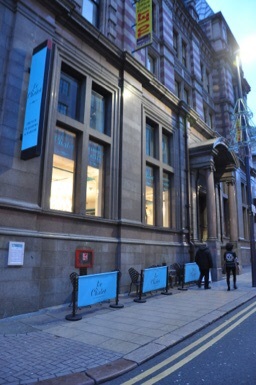 The Tetley Gallery has a Bar & Kitchen serving Yorkshire inspired dishes. Being open all day, for brunch, lunch, tea and dinner, they have a menu that covers all parts of the day. 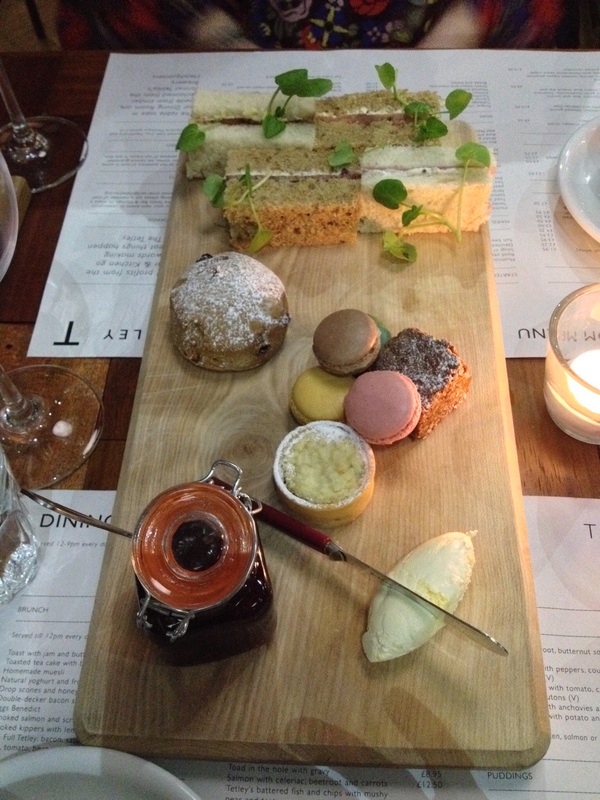 I’d gone to sample their afternoon tea in order to continue my search for the best in Leeds. Our table had specifically been booked for afternoon tea at 4:30pm, for 2 people. I think that’s pretty straight forward don’t you think? We arrived around 4:10pm and when I said I’d reserved a table for afternoon tea the bar man was a little abrupt and just said ‘ok, but we stop serving it at 5pm’. So we thought that’s fine, we’d be sitting down straight away and it would be all good. It was coming to the end of a long week, the last week of school before Christmas, wine was certainly on the cards and much deserved. I ordered a bottle of Argentinian Malbec, now I’m no wine expert at all, but I thought this was quite robust in flavour and lovely. Great to warm us up a little on a cold, rainy, grey day!! The seating area is organised into an area with lovely comfy chairs and sofas near the reception and bar, then a dining room which leads off this. 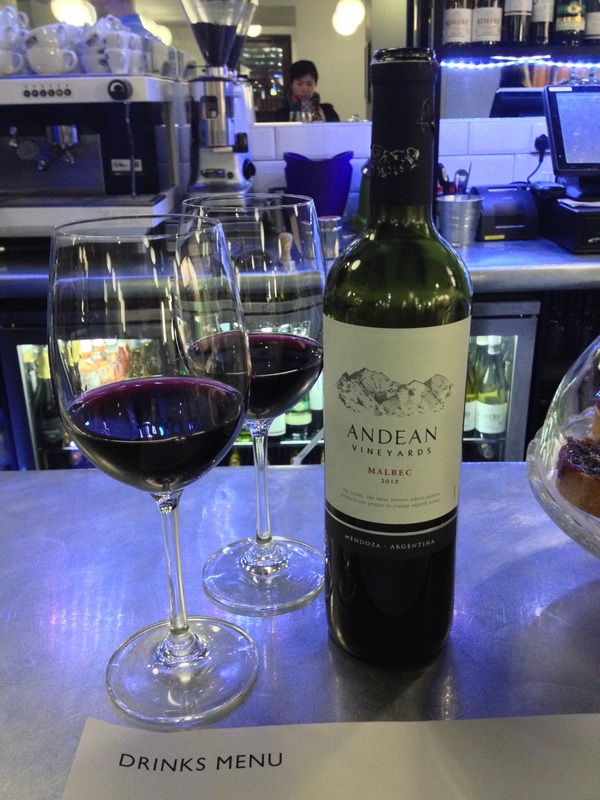 We sat down at a table with comfy chairs and settled in and relaxed with our yummy Malbec. 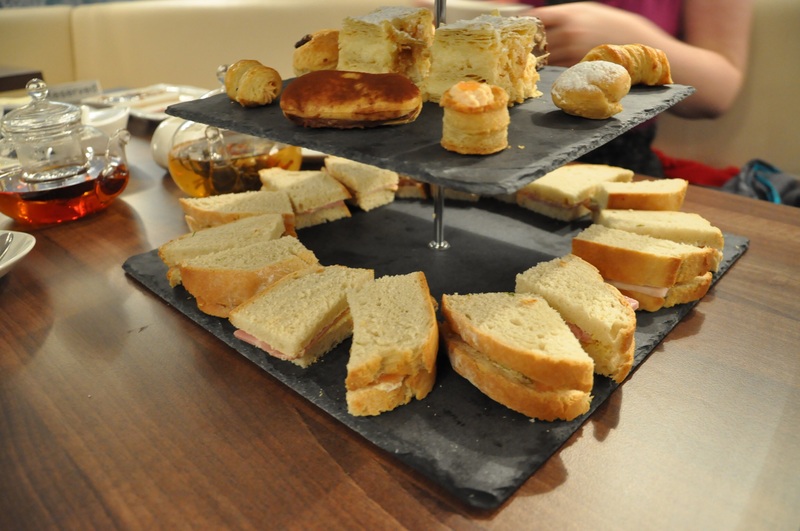 From their menu we could see that The Tetley’s afternoon tea came with a good selection of items – a decent choice of sandwiches, cakes, pastries and a scone with accompaniments, all served with a pot of tea. What you would normally expect really. All for £9.50, which is comparable with other places I’ve been to so far in Leeds. Time was passing, but nobody had come up to our table to ask about us having afternoon tea, so we were a little confused. By the time it got to 4:50pm, getting ever closer to 5pm (the cut off time), we were both getting a little worried. Had they forgotten about us? So just as I was about to ask someone, I could see some of their team looking over at us and a waitress walked across. She informed us that we’d need to move into the main dining room, as they would be serving it in there. I found it a little bizarre no one had actually told us we should go in there in the first place, so we therefore assumed we could sit anywhere. We moved from a comfy seating area to a dining room which was nice, but didn’t possess the comfy feel we were after. Don’t get me wrong it’s a lovely room, but it just didn’t feel right. We wanted to just sit somewhere really comfortable. It was never made clear to us where we would be having tea, and I feel this lack of communication put the experience on the back foot from the start. I feel like I’m being really harsh, and I don’t want to be!! The main dining room is lovely, but it wasn’t where we envisioned partaking in this afternoon past time, we both wanted to be back with the cosy, comfy chairs. We ran with it, but soon our time there got a little stranger, a young lady came over and wanted to make it clear that for afternoon tea there would be just one of each item advertised. Were they expecting us to share everything, even though this was afternoon tea for TWO people??? The mind boggled, this wasn’t difficult to understand: afternoon two for TWO means TWO of everything. My friend had pointed that out maybe we were literally just getting one of each item to share between us. The same lady was back a few minutes later and then wanted to check that we understood that the single of pot of tea would be for two people, and we would have to share it, if we wanted any more tea, we would have to pay extra. The strange got even stranger!! 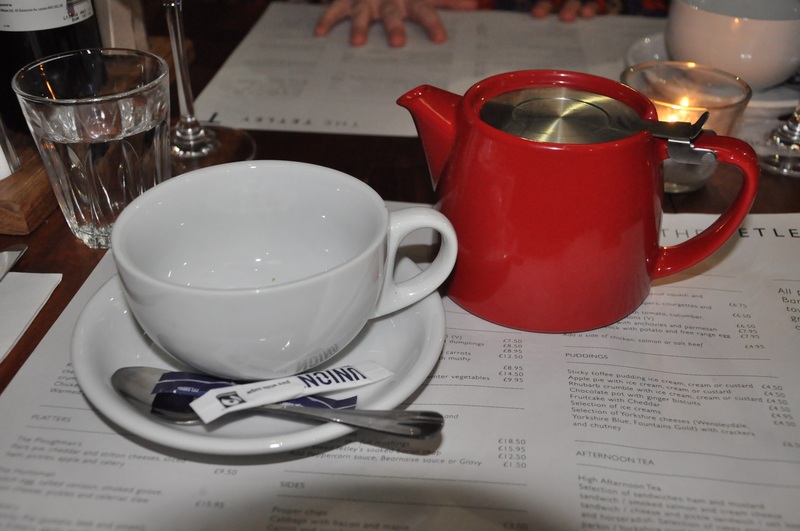 Our tea did arrive and it was indeed a pot for ONE, nice tea as it was, we were a little miffed at the whole getting one of each thing, when there is TWO people! So we waited, it took a little while for it to arrive and I had this preconceived, maybe romantic idea that it would come on the usual three tiers, and that I could see myself working my way through each tier, devouring each little bit. As you see there was no three tier cake stand in sight, but a wooden platter, with ONE of everything!! I don’t ever remember ordering afternoon tea for one to be shared between two people. It all clicked into place – all the strange, awkwardly asked questions. I did feel a little sorry for the lady who’d been serving us, having to ask such odd questions, but it all made sense now. Everything looked pretty all laid out, but before it had arrived my friend had made a joke about having to cut sandwiches in half, not really thinking she’d be doing it! 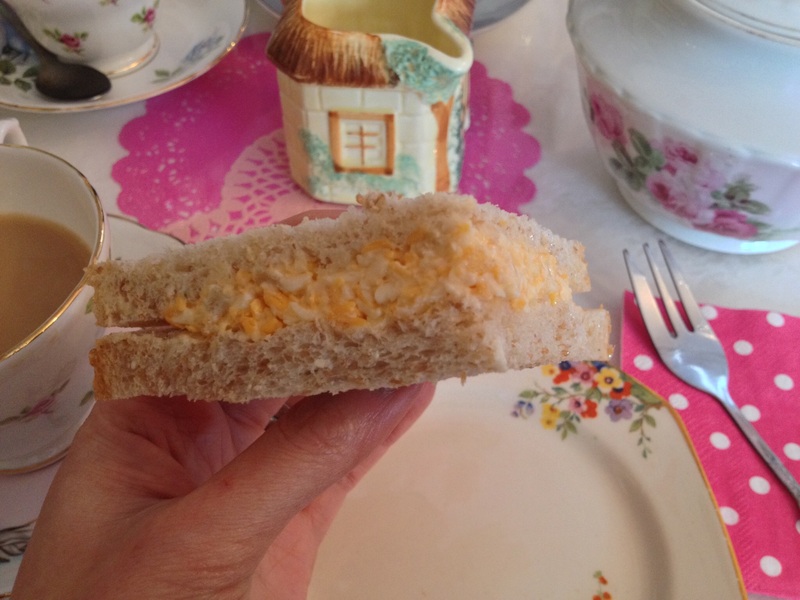 So we divvied out the finger sandwiches which were nice, each had a good filling, the thick sliced bread was ok, but could have been a little softer. 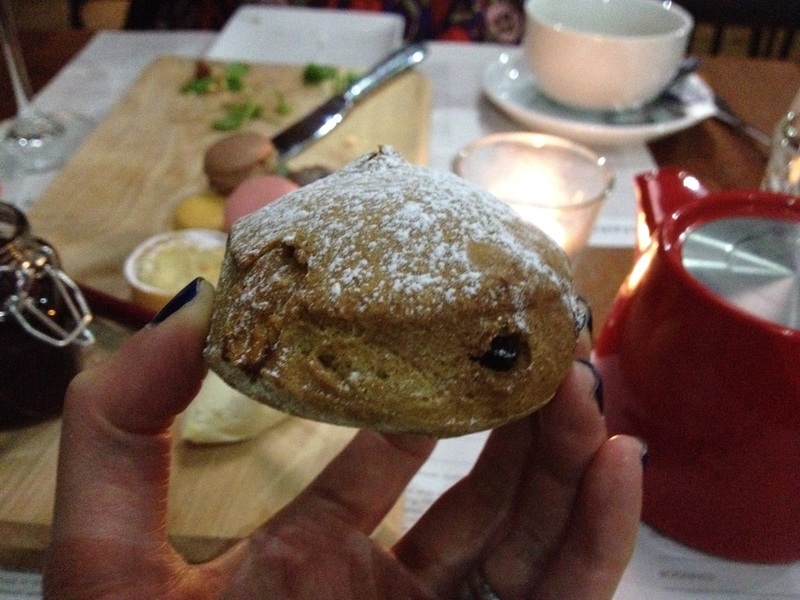 The scone was smallish, but was served warm and was supposed to come with butter, jam and clotted cream. The jam and cream were evident, but there was no butter, I don’t think butter is particularly traditional with scones, but nevertheless it wasn’t there. It was however, a nice scone – it had a crumbly texture, but it didn’t fall to pieces and the clotted cream and jam were good. 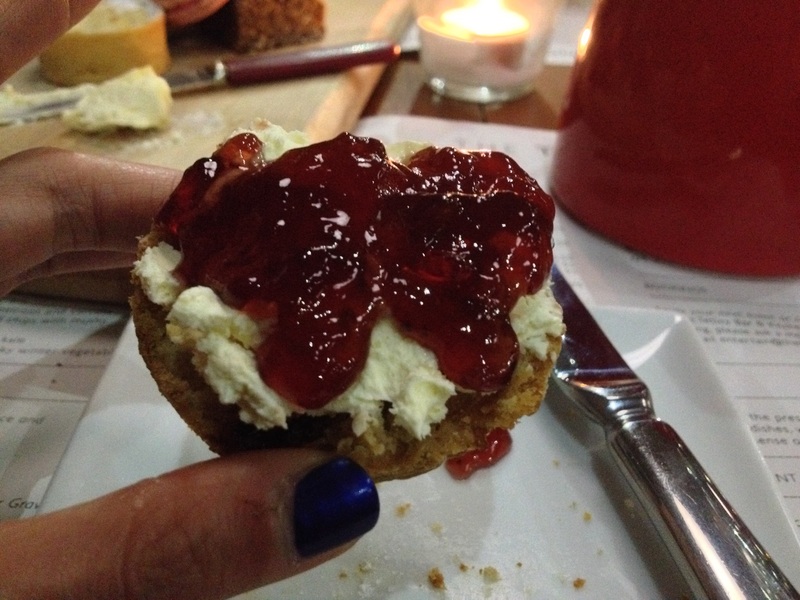 There was plenty of jam to go round for another scone, so it was a shame we had to share one between us. The Parkin was nice – moist with the characteristic taste of ginger, while the Yorkshire curd tart has a lovely short pastry case, tasty enough filling with a few currants dotted around. The macarons were good, a little inconsistent with some being lovely and chewy, while others were crumbly, the individual flavours were good though. 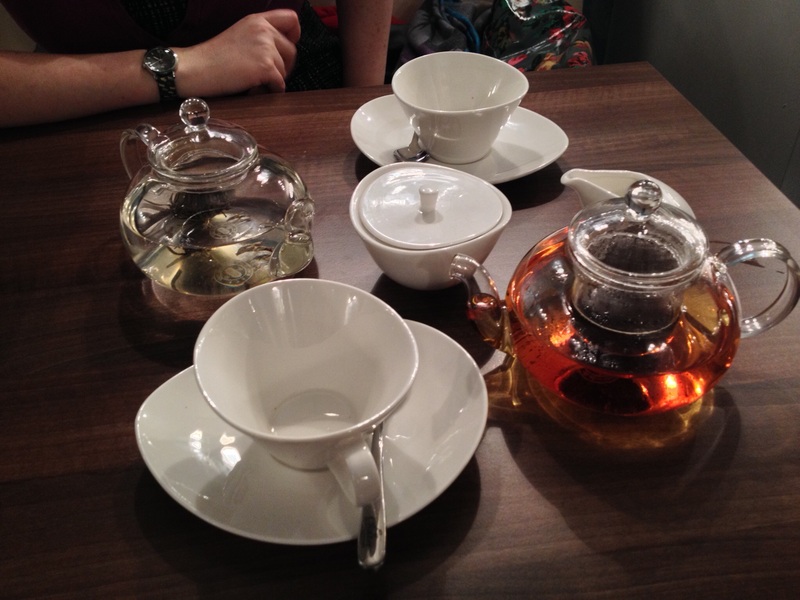 All in all, each item was very nice – the whole confusion about why we only got afternoon tea for one baffles me. When we finished we had to wait quite a while before our table was cleared, even though two larger groups had arrived for dinner, it was very clear we had finished. There seemed to be lots of standing around and chatting from staff, which wasn’t particularly impressive. After years working as a waitress at a busy restaurant during university, I know myself that you’ve got to be alert at all times and make yourself visible. We were so confused about the whole thing that when we asked for the bill, the waiter was asked to check if what we received was supposed to be for one or two people, just in case they were going to charge us for two. He came back with the bill in hand and said it had been for ONE!!! A bizarre experience the whole thing was really. Apologies, I really don’t like being negative and try to be positive, but I feel that as well as good food, good service is also paramount to giving people a memorable experience. The Tetley has been open just three weeks and maybe still settling into things in the Bar & Kitchen, so I’m sure service will improve. I would still like to come back again for lunch or dinner in the future. Food: Each part was lovely, more would have been better as we were still hungry. Service: Lack of communication, more understanding needed of what afternoon tea entails, if a table is booked for two people, that automatically means there should be two of everything!! Service was polite, but quite slow at times. Atmosphere: Was quiet as we ate alone in a large dining room, we’d rather have been in the comfy chair area where there was more of a leisurely atmosphere. Ooh I love a bit of afternoon tea, it’s the height of sophistication when done well. I’ve had a few experiences of this indulgence with differing reviews in the past, and have been wondering for ages if there was anywhere decent in Leeds to partake in this pastime. The best was Fortnum and Mason; simply a perfect, classic experience. Everything was picture perfect, that day we had High tea, so I remember very distinctly having the best Eggs Benedict I’ve ever had, then a selection of PERFECTLY made sandwiches and pastries. After which, we selected some delectable cakes from a tray of absolute gems, brought around by a perfectly dressed gentlemen. The tea was also a revelation, I love a good cuppa, but I’m a PG tips or Yorkshire Tea girl. I’m certainly not a tea connoisseur, but that afternoon I selected Russian Caravan, a white tea from their World Tea selection which was light, slightly fragrant and still comforting like a good cup of tea should be. My subsequent trips to Fortnum and Mason have always included buying a box of Russian Caravan to bring home with me. I loved that whole afternoon because it felt like an event and always remember it fondly. On the flip side for a trip to Glasgow, I’d researched the best places for afternoon tea and of course there’s the famous The Willow Tearooms, but I didn’t want to go for the obvious this time. Instead I chose The Butterfly and the Pig because I’d read great reviews, and I liked the idea of it having a quirky charming side, as well as doing great cakes etc. Everything was spot on about the decor and the quirky charm, but we came away disappointed after having sandwiches with very dry bread, just a few cakes to choose from what was a much bigger list. Then I was also very surprised to be watching TV programmes on an LCD screen attached to the wall, it really wasn’t what I was expecting. We had an ok experience, but my expectations had been so much higher. So saying this I’ve been wanting to do afternoon tea in Leeds for so long, my friend Lucy Reynolds had just written about The Queens Hotel, saying it was just ok. I’d thought about other locations, such as Harvey Nichols, The Food Academy at Flannels and Browns. What about something independent, anything Leeds based!!! 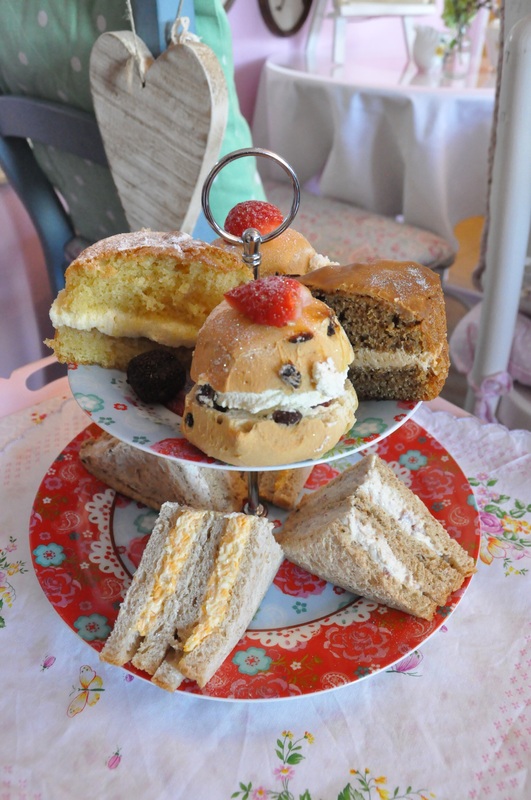 Who does great afternoon tea near me?? So this is me in search of the perfect afternoon tea in Leeds. 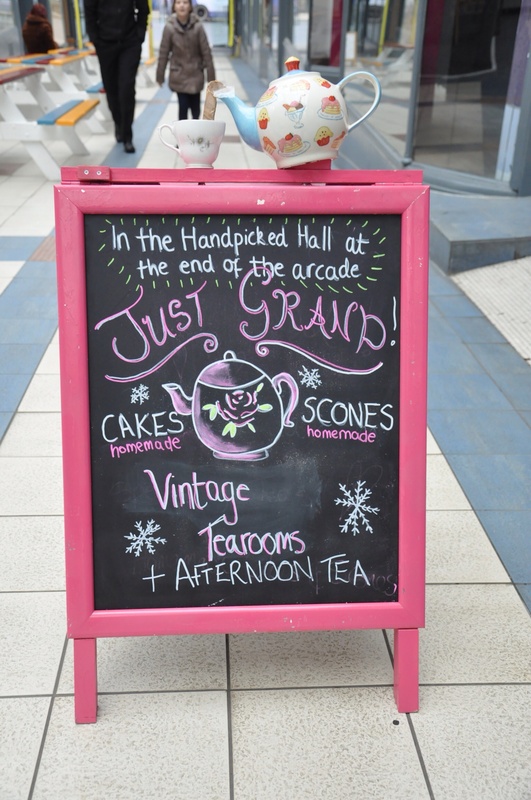 Well I visited Just Grand!, a vintage style tea room, at the bottom of Handpicked Hall in the The Grand Arcade. It’s been open since August and every time I’ve driven by or walked passed it’s been busy. 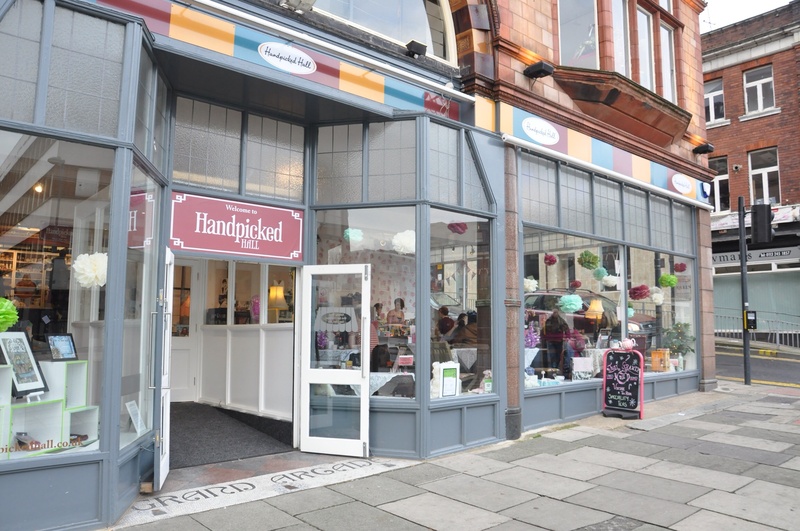 For those of you who don’t know Handpicked Hall, it’s a multi-levelled space containing many different independent traders. They want you to step back in time as you walk in, they have created a space that reminds you of a time decades ago, the 40’s and 50’s. 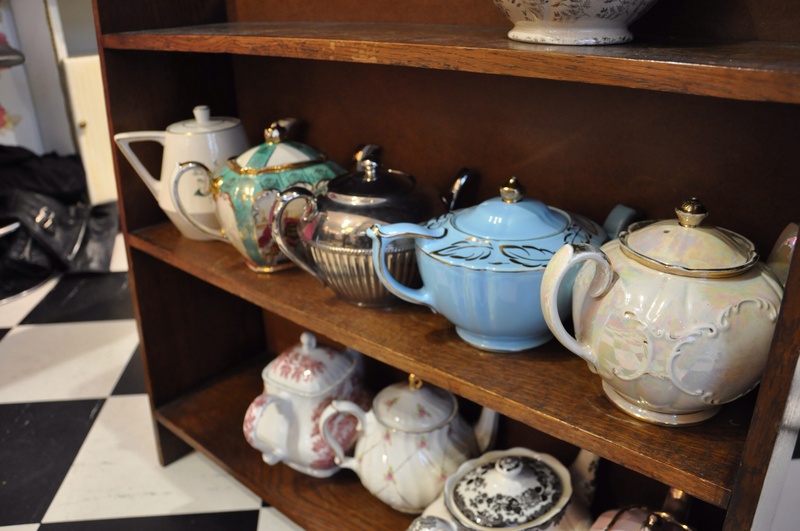 There are homemade delights like cakes, scones and sandwiches on offer, but also specialist loose leaf teas and vintage soft drinks like Sarsaparilla and Cream Soda. All of this while music harking back to the good old days plays in the background. 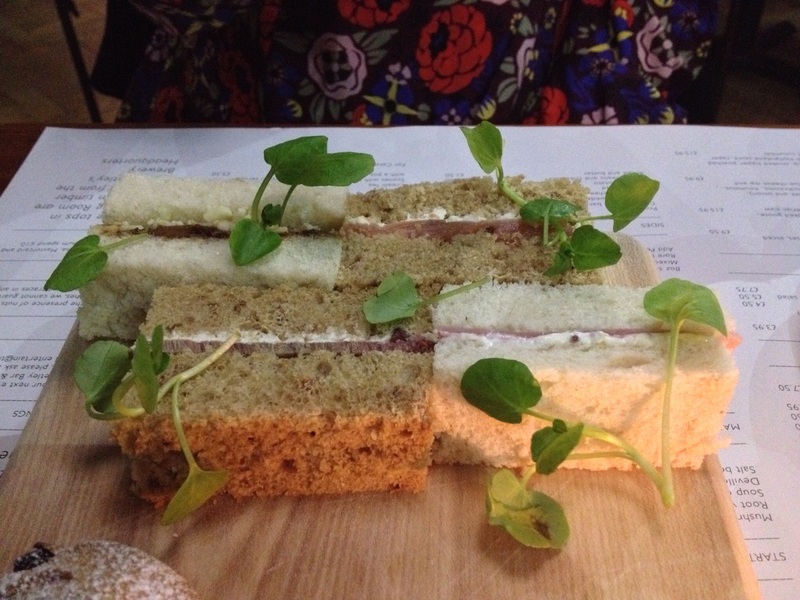 Their version of afternoon tea consisted of 4 sliced sandwiches – hand carved ham, cheddar cheese, free range egg mayonnaise and cress, cream cheese and cucumber. On balance it may have been good to have another sandwich with meat, e.g. beef and horseradish or smoked salmon and cream cheese to even the choice a little more. 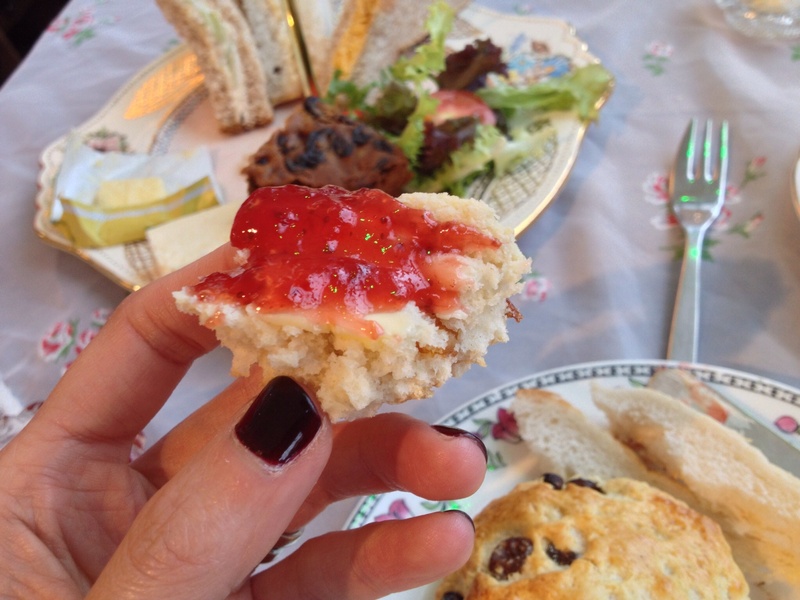 There was a large scone, they had 3 varieties to choose from; I chose the standard fruit, which came with the essentials – butter, clotted cream and jam. Some fruit cake and a wedge of Wensleydale cheese was also part of the mix. 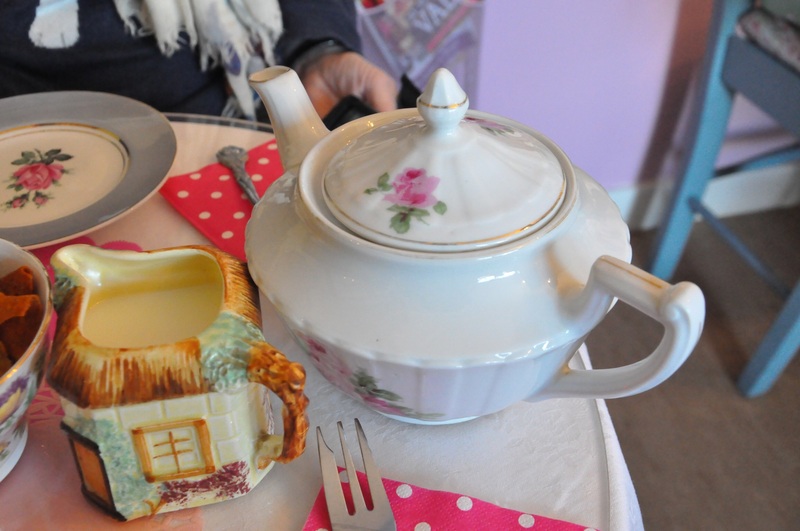 They had a nice selection of loose leaf teas to choose from, but I stuck to good old Yorkshire Tea that arrived in a pretty china pot, and was also unlimited. A nice touch!! Everything I ate was good, the sandwiches were freshly made, with soft bread and good fillings. I think if I was to go again, I would just select specific items though, rather than going for afternoon tea as I am fussy and didn’t eat each item. I don’t care much for fruit cake and I’m not really a cheese fan, so the cheese sandwich, fruit cake and Wensleydale I left. Not sure what the salad garnish was there for either, that’s just fussy me though!!! I’d definitely go back for the scones which were lovely, and try the other cakes too. It certainly had a quirky vintage charm, the staff looked great in their vintage garb, and the ambience was livened up by the music in the background. For £9.50 it’s pretty good value, the place is relaxed with lovely people. I’d recommend Just Grand! Food: Sandwiches were good and they serve great scones!!! Maybe could do with more meat options in sandwiches. Even start doing more savoury items like Eggs Benedict, Welsh Rarebit etc for High tea. Service: Friendly and attentive staff. 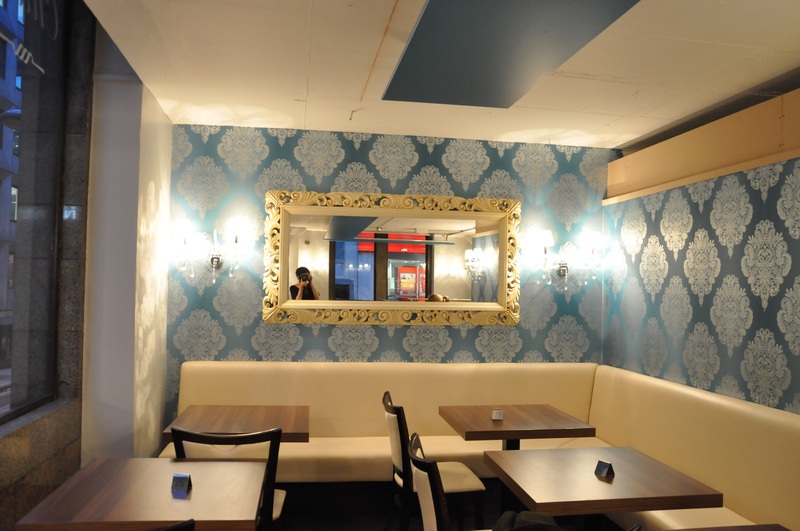 Atmosphere: Relaxed environment, quirky charm about the place.